Sizzling steaks, Malbec from Mendoza, cheese-laden pizza and pastries galore — Argentines are proud of their food, from the succulent to the sweet. Local culinary quirks stretch further than just drinking mate and devouring meat whenever possible though. Here certain foods are meant to be eaten only at certain times, and mealtimes will seem regimented to those used to eating whatever they want at anytime of day. Say goodbye to piles of pancakes, bacon and cereal. An Argentine breakfast is short and sweet, with emphasis on the sweet. Expect pastries, biscuits, perhaps some cake, or a few slices of toast eaten with soft cheese and jelly. Argentines usually wash down their breakfast with a coffee or yerba mate tea, setting the trend for the rest of the day. Lunch is usually the largest meal of the day. A favorite at any time is the empanada, a stuffed savory pastry. Two or three of these constitute a main meal at either lunch or dinner and are often eaten as snacks. At dinnertime, an empanada may be ordered as a starter. Those who have been in Argentina for a while may get empanada fatigue, or indeed empanada belly from all that cheese. If this happens, seek culinary company in other empanada-overloaded foreigners — Argentines appear to never tire of their favorite snack. Miga sandwiches, are usually only eaten in the afternoon, but slip onto buffet menus in the evening. 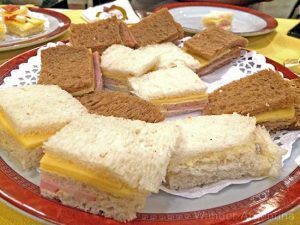 They are flat sandwiches made from crustless white bread and are the sort of thing one might expect to nibble at a child´s birthday party. 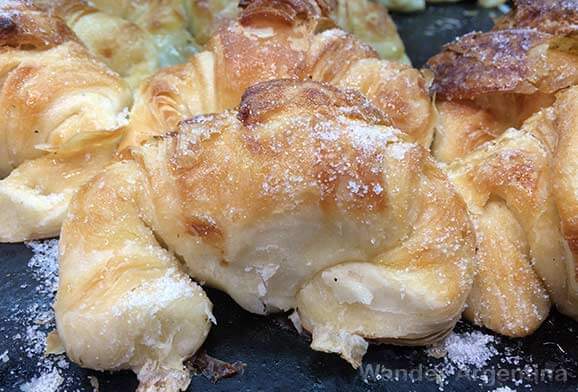 Tasteless or not, they are extremely popular in Argentina and the bakeries are full of varying combinations of the sandwich – though the classic ham and cheese reigns as the most popular. Other standard Argentine fare draws from the Mediterranean influence, including milanesas (breaded meat patties), pasta dishes and tartas, which are similar to quiche, but with less egg. For more egg try a tortilla, which is not a flatbread but an omelette. 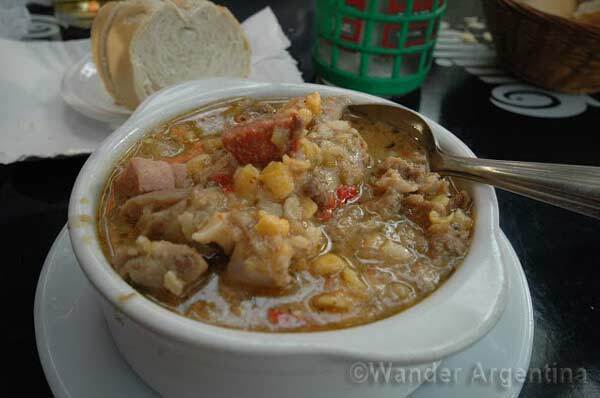 Foods traditionally eaten in the North of Argentina including stews such as locro and guiso de lentejas are popular during the winter months. 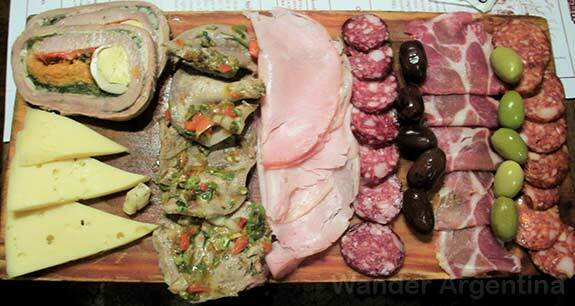 Cold cuts of meat, cheese and olives constitute a picada, a platter which can be an appetizer at a barbecue or shared as a protein-powered snack at restaurants such as Buenos Aires’ La Poesía. In order to keep going during the long gap between lunch and dinner, adopt the local habit of the merienda — a couple of pastries and a coffee eaten between 5-7 p.m., sometimes in a typical cafe. The evening meal is not even thought about before 9.30 p.m., so a tea time snack is often necessary. Women at this juncture will declare they are ‘cuidandose’ – on an endless diet before nibbling their sugary treats. 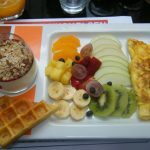 Despite the daily intake of unhealthy snacks, the ceaseless diet seems to be the reason why Argentines are generally thin, though some believe it’s because mate suppresses the appetite. Other quick snacks during the day come from kioscos (convenient stores), which display a large variety of sweets, chocolate, biscuits and other sugary snacks. 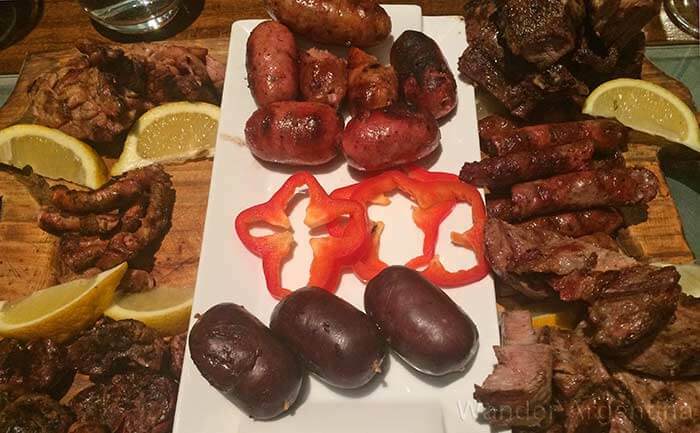 An asado (Argentine barbecue) appetizer consists of sausage and organ meats including chorizo, morcilla, chinchulin, molleja, and riñón (sausage, blood sausage, offal, gizzard and kidney). Argentines have a well-earned reputation as carnivores. At any asado or barbecue, the general custom is to eat as much meat as is humanly possible. Don’t make the mistake of thinking that what’s is on the table is all that’s available — there’s always more coming off the grill. Squeamish types should avoid asking which part of the animal they’re eating, the answer will likely put them off their intestines. (For those who really want to know, see our post, Cuts of Meat). Eating salad with the asado is acceptable, if only as a symbolic gesture to make one feel better about their gluttony. The local (and supposedly spicy) relish chimichurri is the proper accompaniment for meat — be aware that slathering a steak in ketchup will draw disapproving looks. Pizza is an acceptable meal to eat at any time and is devoured with great gusto. The Argentine enthusiasm for a thick wedge of dough overflowing with mozzarella (or mozza) and a couple of olives is endless. Don’t let the team down by ordering anything fancier than a basic ‘mozza’, except for perhaps an oniony feast in the form of fugazetta. Vegetarians should note that a vegetable pizza comes with acelga (a chard similar to spinach) and a white sauce instead of cheese. Don’t forget to order faina, a chickpea flat bread. This should be placed on top of the pizza so both can be eaten together. Pizza is usually consumed with beer, or in traditional pizza houses, the sweet wine moscato. Among the company of Argentines, who, it should be noted, eat their pizza with a fork and knife, it is wise not to suggest that the pizza elsewhere in the world — even Italy or New York — rivals the Argentine version. This not only causes great offense, but the pizza-traitor will be regarded as deranged and forced to eat yet more cheese-laden-pizza until they admit they are mistaken. The sacred sweet of Argentina is dulce de leche. Never make the mistake of suggesting that the sweet spread is the same as caramel, or inferior to it. Dulce de leche contains no butter, just milk and sugar, and makes an appearance in the majority of sweet snacks. Dulce de leche is particularly common in pastries, alfajores (Argentine biscuits) and the popular birthday party cake, chocotorta. Other common puddings include flan, rice pudding and sopa inglesa, which is a cake similar to another local favorite, tiramusu. Zuppa Inglese, as it’s known in Italy, translates to ‘English soup’ as it was inspired by English desserts popular in the 19th century. Ice cream is also an Argentine favorite, and is the customary asado dessert. It is high-quality and made the old fashioned way. It comes in the nation´s favorite flavors, dulce de leche, and mate. It must only be a matter of time before the idea of a Malbec or beef ice cream catches on. For a sweet/savory dessert combo, adventurous types should try quince (membrillo) with cheese. The tang of the quince mixed with the cheese tantalizes the senses of some, and leave others wondering what all the fuss is about. There are certain dishes which are customarily eaten on particular days. Gnoccis, (ñoquis spelled the Argentine way) are eaten on the 29th of the month. This tradition began as gnoccis are a cheap filling dish that were perfect for the end of the month when money was tight. These days, the dish is not actually that cheap, but Argentines counteract this by putting money under their plates as they eat their gnocci to attract prosperity for the coming month. On patriotic holidays such as 25 of May and July 9th, proud Argentines cook up a stew in the form of locro. This hearty dish is made of corn, pumpkin, beans and meat and is perfect for winter evenings. Word of warning: some versions contain tripe, or cow intestine. Assume that a vegetable empanada is a healthy option full of fresh vegetables Empanadas de verdura rarely contain anything more than acelga, which is a substitute for spinach. Ordering empanadas, tarta or pizza with salad or another side dish These foods should not be combined with anything except each other. Eating salad with pizza is a viewed as a disgusting mix and should not be attempted without fear of serious social reprisal. Adding black pepper to food Add large quantities of salt, but never pepper on everything – including salad, especially salad. The Argentine salt obsession is so widespread that in 2011 the government actually made it illegal for salt to be put on the table in restaurants. The waiters of Buenos Aires have mostly chosen to ignore this law. Expect anything to be spicy Truly Argentine taste buds will not tolerate spice, and have tongues as sensitive to chili as they are to badly prepared meat. Foreigners wanting to blend in should forget the flavor altogether and remember that plainness is the spice of life in most Argentine households. Don’t believe it? 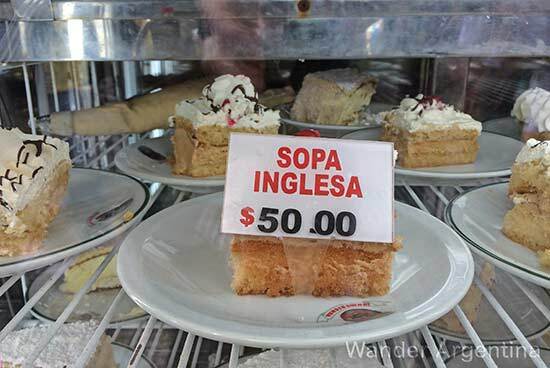 Try a milanesa de soja. Completo means you burger will come with lettuce, tomato, cheese, ham and the key ingredient, a fried egg. In other words, one meal closer to a heart attack. Add mayonnaise, ketchup and mustard to get the full effect. 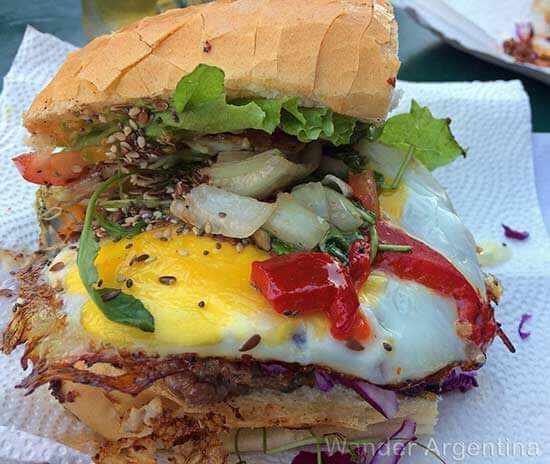 → Discover more about Argentina’s food and culinary traditions on one of our Buenos Aires Food Tours.